An epic lightsaber battle took place between Princess Leia and Darth Vader for the fate of the galaxy. Well, okay. It was last Sunday night in Disney’s Hollywood Studios. Princess Leia was played by Minnie Mouse and Darth Vader was played by Goofy. And the fate of the galaxy might be a bit of a stretch. But this dining experience was, well, epic. 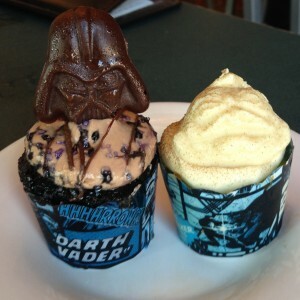 During Star Wars weekends, Hollywood and Vine’s dinner buffet is turned into Jedi Mickey’s Star Wars Dine at Hollywood & Vine. 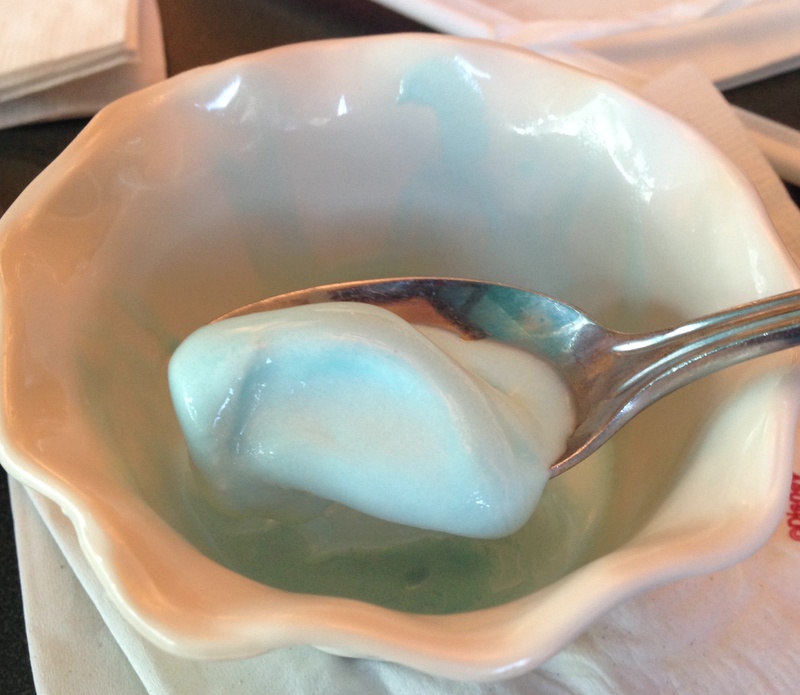 Even if you’ve done more character meals than Mos Eisley has scum and villainy, there are some unique aspects to this meal. First is the sheer number of characters and their unique apparel. During the course of your meal, you get to see Mickey, Minnie, Goofy, Donald, Chip, and Dale. Above and beyond that, each one is dressed up in Star Wars costumes. 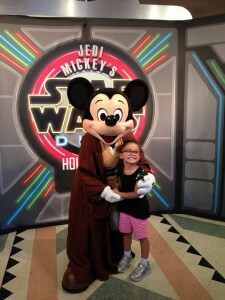 Mickey is dressed as a Jedi master. Minnie is Princess Leia. Even in his Mickey boxers, Goofy still rocks out a Darth Goofy costume. Yes, Donald is a little short for a Stormtrooper, but he still dresses the part. And Chip and Dale as Ewoks are a combination of cute and mischief. When you first enter Hollywood & Vine, you get your picture taken and receive a PhotoPass card and autograph sheet. (The characters do not do autographs during the meal. We found that not worrying about autographs means that you have more time for some really awesome character interaction and more chances for photos.) The PhotoPass card allows you a free download of that initial picture. PhotoPass photographers do not come around with the characters, so you’ll still want to have your personal camera at the ready. As you are seated, you are handed papers that are red on one side and blue on the other. By rolling this paper up (and with the help of a rubber band from your server), you can make your own lightsaber. 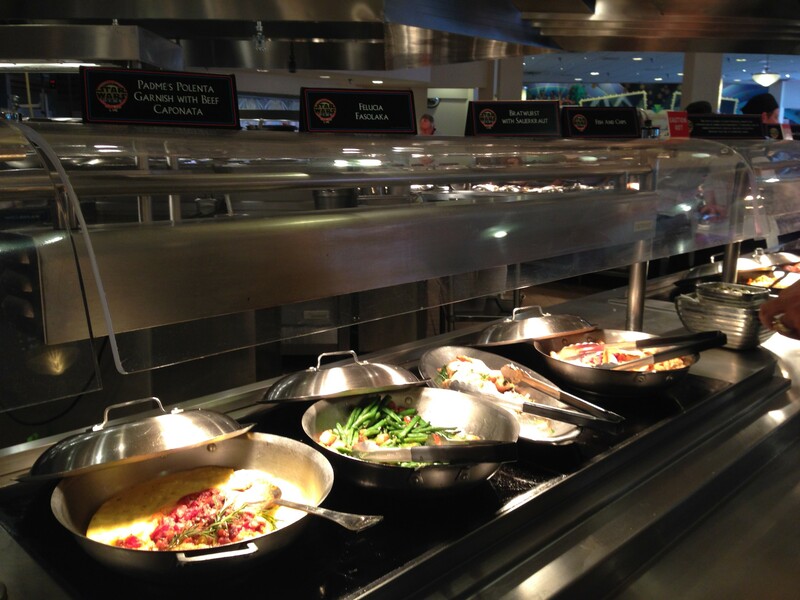 During the meal, you choose a side to cheer for and support. Red is Darth Goofy and Stormtrooper Donald, and blue is Jedi Mickey and Princess Leia Minnie. Remember that epic lightsaber battle I mentioned? Well, when Darth Goofy stopped at the table next to ours and saw that the table was still undecided, he proceeded to start rolling them all to the red side. Princess Leia Minnie came up behind him and grabbed each one away, switching them to blue. Everyone nearby was in stitches as they “fought” to see who could roll the most lightsabers to their color the fastest. 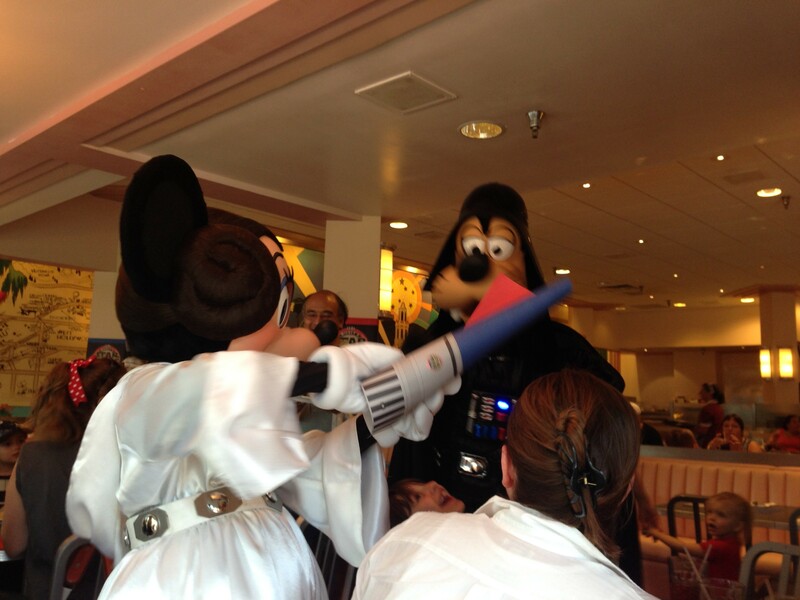 In the end, Princess Leia Minnie sent Darth Goofy packing—but all in fun, of course. I personally love when characters interact with each other, but this was by far the most fun I’ve seen at a character meal. Even though the fun and memories made are priceless, in the end, you also are paying for a meal. 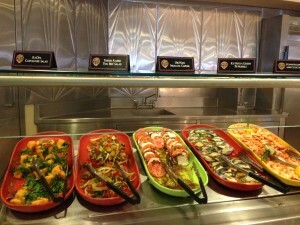 If you’ve not been to Hollywood & Vine, the buffet is the same on both sides of the restaurant and has sections for bread, cold salads, hot entrees, a carving station, and children’s food, plus a dedicated area for desserts, including soft-serve and a chocolate fountain. Although I enjoyed much of the food I ate, I’ll be the first to admit that you are going there for the experience and not for the food. Still, the salmon, meatballs, pork loin, lobster and shrimp macaroni and cheese, polenta, pretzel rolls, and caprese salad had me going back for more. 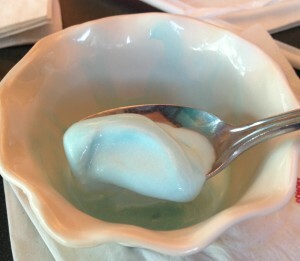 Other dishes were merely okay. 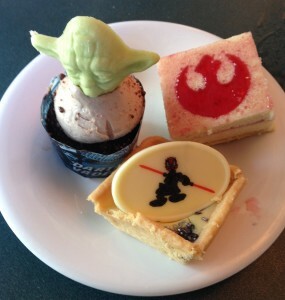 They also had a selection of foods for young Padawans (with jokes about the theme being “beige food for beige Padawan wear). There’s the ever-present macaroni and cheese, along with chicken tenders, corn dog nuggets, tater tots, and some steamed vegetables to try and pretend that this is a healthy meal choice. Also don’t miss the create-your-own pasta station, next to the carving station. Where the food really excels, however, is the dessert selection. 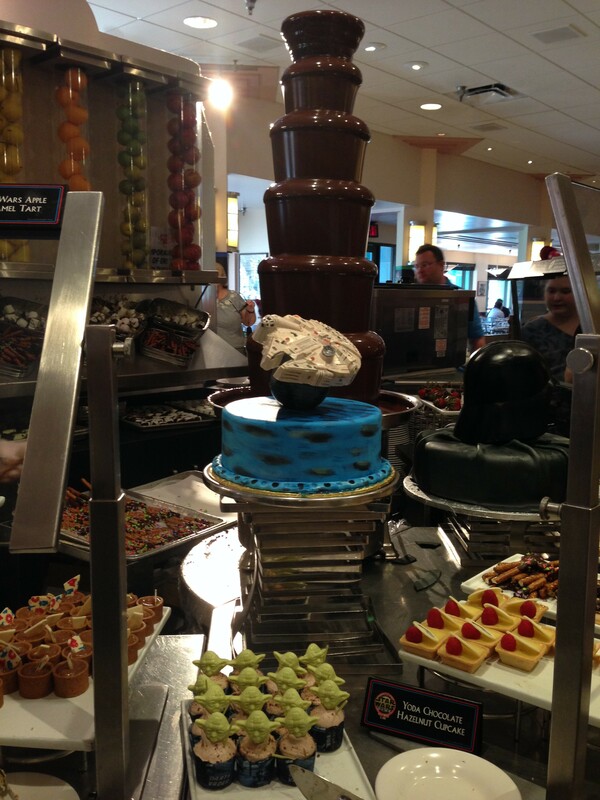 Having done dessert parties several times in the past that cost almost as much as the full dinner here, I could almost justify this meal just for the character interaction and the desserts. Reservations for this dining experience opened up several weeks back, but as of the morning of Thursday, May 21, I checked and found a few open tables still available for this weekend. Also, last weekend there was limited availability for walk-ups. If you don’t have a reservation, my advice is to check throughout the day today through Saturday (as people do last-minute cancellations) or show up right at 4:15 and ask what’s available. If the Force is strong with you, you just might get in. Jedi Mickey’s Star Wars Dine at Hollywood & Vine costs $57.99 for adults and $34.99 for children (ages 3 to 9) or two table service credits and includes a non-alcoholic beverage but not gratuities. No discounts are available, and theme park admission is required. My husband and son participated in dinner on Friday last week and loved it! 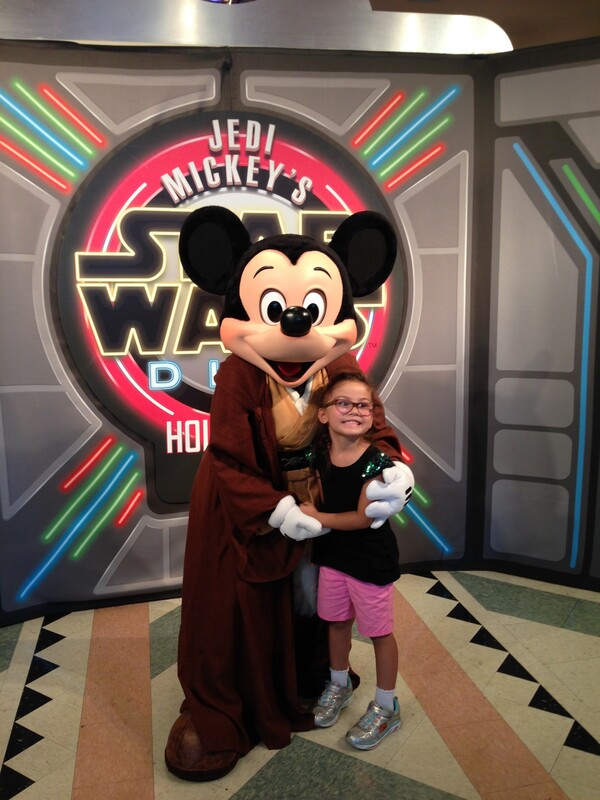 We hadn’t been told that a download of the initial picture taken with Jedi Mickey was complimentary. I called Disney’s Photo Pass support team to verify and they told me that the complimentary photo download is not included this year. They did provide it last year, but this year they are not offering it. You mention that reservations opened up several weeks back – was there a specific date they opened or do you have to keep checking? Planning to bring my Padawans next year. . .